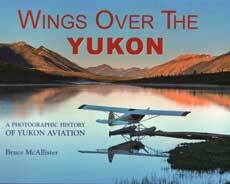 In his sixth aviation history book, author Bruce McAllister takes the reader on a photographic journey, tracing the development of aviation in the Yukon Territory. There are chapters on the very first aircraft to operate in the Yukon, how aviation linked communities, the construction of the Alaska Highway, the role of the RCMP Air section, epic search and rescue missions, the air tankers role in firefighting, the opening up of the Arctic, the glacier pilots, and aerials of the old airstrips. 208 pages, SB, 10 x 8.5, B &W and Color photographs.